New Delhi: While countries all over the world demand price cuts in Tuberculosis (TB) drug Bedaquiline from Johnson and Johnson Pvt. Ltd, India is faced with an unusual problem—it is yet to procure a third of the charity courses of the drug donated free of cost by J&J, a top executive said. “The uptake has been much slower than anticipated," said Vikram Singh, vice-president, medical affairs at Johnson and Johnson Pvt. Ltd. According to executives at J&J, if the government wants to achieve the target of eliminating TB by 2025, it will have to screen and diagnose many more people. The people who proposed listing of Indian Railway Catering and Tourism Corp. Ltd (IRCTC) did not talk to those who proposed a waiver of the service charge on e-tickets, it seems. The government plans to list IRCTC along with two more railway public sector units. Prospective investors will find in its fiscal year 2016 annual report a wealth of information, unusual for an unlisted company. That pleasure will turn to dismay when they relate what they see there with the government’s proposal to waive service charges on online rail ticket booking. Rail ticketing contributed to Rs551.5 crore of IRCTC’s FY16 revenues, twice that in the previous year. The company charges Rs20 per ticket for sleeper- class bookings and Rs40 per ticket for air-conditioned class bookings. It also does online ticketing for air travel and the aggregate income from Internet ticketing is Rs632 crore. Rail accounts for 87% of Internet ticketing income, which in turn contributes to 43.3% of total segment income. Wait till you see the profit contribution. Internet ticketing contributes Rs262 crore to the total profit of Rs260 crore (one division incurred a loss). If we assume rail e-ticketing’s profit share in Internet ticketing in the same proportion as revenue, then 87% or Rs228 crore can be attributed to rail. Knock that off and you are left with Rs32 crore as total profit. 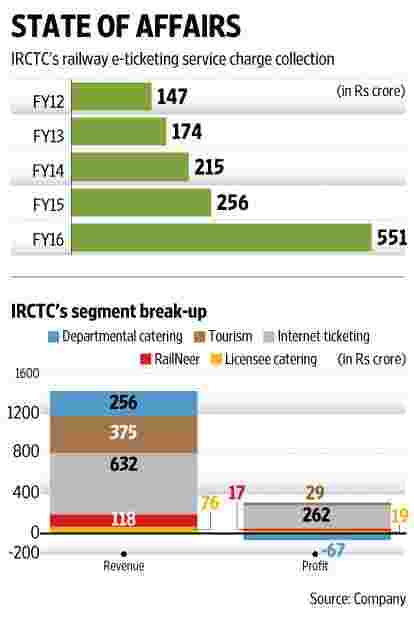 Other segments such as licensee catering, RailNeer (packaged drinking water) and tourism (it offers tour packages) are profitable, although not as much as Internet ticketing, but departmental catering incurred a loss of Rs67 crore. Without rail ticketing, there is very little left of its profit. IRCTC’s annual report says these charges are needed to cover its infrastructure and software costs. The railways benefit too, as 50% of the service charges are shared with it. The fees and the sharing proportion are approved by the railways. As a state-run company, the government can choose to waive service charges, and instead reimburse IRCTC its costs. Why should such a company list, in the first place? A public float makes sense only if there is clarity on IRCTC’s ability to earn revenue, not just now but in the future as well. The government has pushed back its deadline of ending TB by 2015 and, in March this year, began partnership discussions with J&J for eradication of TB by 2025. A detailed email was sent to the Union health ministry on the status of discussions with J&J, utilization of bedaquiline did not elicit any response till the time of going to the press. At present, India is one of the few countries where J&J offers the drug free of cost under a conditional access programme, which will end in March 2019.